This article is part of a series created in partnership with SiteGround. Thank you for supporting the partners that make SitePoint possible. InfiniteWP is an administration panel that provides almost effortless management of multiple WordPress websites. Do you administer more than one WordPress website for your organization? Do you host WordPress websites, or are you a developer who maintains sites for clients? This is the perfect tool for you, if so! Plugin Updates – Keeping track of the endless security updates, bug fixes, and new-feature updates of every plugin deployed on your WordPress sites can be extremely tedious, especially if you have multiple sites to manage. These plugin updates can be done with a click of a button from InfiniteWP. Platform Updates – In addition, updates to the WordPress platform can be conducted from this central location as well. Are you familiar with the changes in the new version? If so, you can easily update all of your sites to it. Theme Updates – What about updates to themes (or parent themes) that have been used to build the UI of your websites? Those, too, can be updated all from the admin panel, whether you’re using the same themes on multiple sites, or all unique ones. If it is updatable within WordPress, it will be updatable using InfiniteWP. 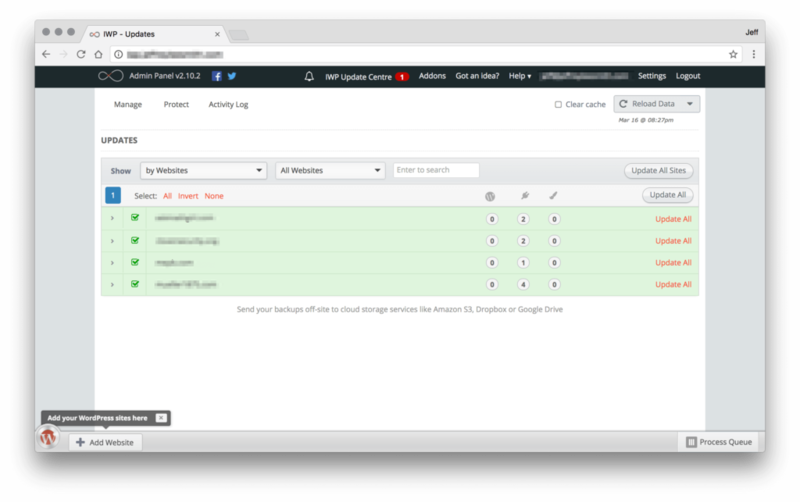 Backups – In addition to all of the update features, InfiniteWP also allows you to take backups of your attached websites, the files and database of them. This enables you to update with confidence. Have some untested plugins to update? Back the site up first! 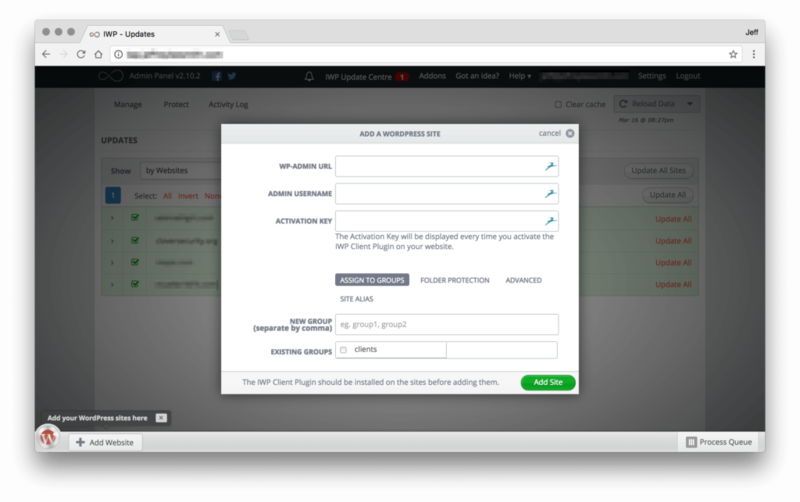 This mix of options means that whether you’re on a shared host with a cPanel, on a VPS, or any other hosting option, it’s likely that you’ll be able to find a solution that meets your needs, and deploy InfiniteWP to manage your WordPress sites! Once you’ve installed InfiniteWP and logged into the admin panel successfully, you’ll encounter the dashboard screen. Your next step in connecting a website to your InfiniteWP dashboard will be to add the InfiniteWP plugin to the WordPress website you wish to manage with InfiniteWP. You can do this easily by going to your Plugins menu, choosing to Add a Plugin, and searching for InfiniteWP. Once this is done, and the plugin activated, you will see an alert panel in WordPress conveying important InfiniteWP information to you. Now, head back to the InfiniteWP panel and click the “Add Website” button in the bottom left. This should bring you to a new website form. You can paste the website information into this form. And now your WordPress website is connected to the admin panel! Checking the connection is a breeze. You can click the WordPress icon in the bottom left to pull out the Websites Drawer. This will contain a list of WordPress websites you’ve linked to the InfiniteWP admin panel. Hovering over the name of one of your sites in the list will pop out an information panel next to it. Here, you’ll see several links. One lets you go straight to the WordPress admin panel for that site, one to start a post, one to do updates for that site, etc. You can also choose “Reload Data”, and see the progress of that operation in the Process Queue in the bottom right of the admin panel, as well as whether it succeeds or fails. If it succeeds, all is working well! Running updates and backups is a breeze with InfiniteWP. You have options to run specific updates on specific sites, to run them as groups, or to run all available updates. Particular updates can be run from the admin panel’s dashboard. You’ll see a list of your websites which have updates which need your attention. If you click one, it will break down into a list of necessary updates. This makes it easy to cherry-pick particular updates from the list and do only those updates for the selected site, one at a time. 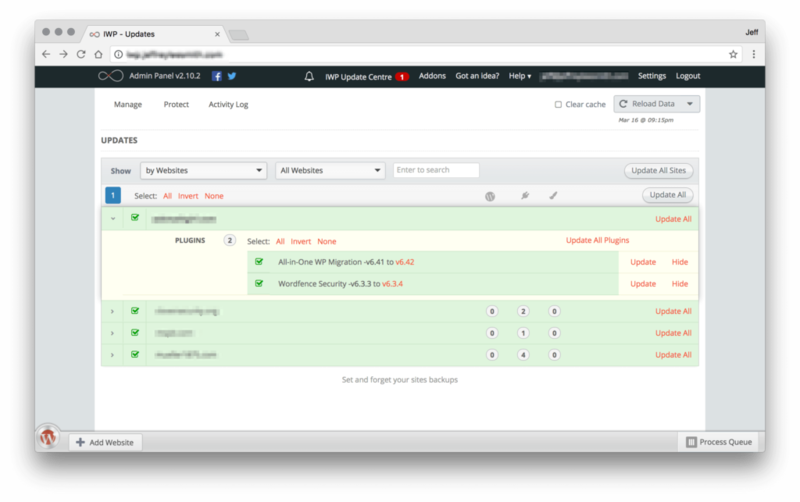 You can also do updates in a batch – for example, if you wish to simply update everything that can be updated on every site, you can just hit “Update All Sites” on the dashboard, and InfiniteWP will attempt to update the platform, plugins, and themes of every connected site and report on its success or failure in the Process Queue. Website can also be added to Groups in order to further segment your managed sites. This can be done by going to the Drawer, hovering over your site, and choosing “Edit Site Details”. On this screen, you will see an Assign to Groups option. After you have sites assigned to Groups, from the dashboard you can pick to show specific Groups rather than “All Websites” – and then use “Update All” to update all of the websites in that particular group. Production and Staging Groups. If your website management dictates that you have staging environments for each of your sites, you might wish to do batch updates to the staging environments first, to ensure there are no compatibility or other issues with the updates, before then proceeding to deploy the same updates to the production sites. Project type is another Group that might prove useful. Differentiating between your own projects and paying clients, for example, might be useful. Another useful Group could be client types. You might have monthly maintenance clients, quarterly maintenance clients, clients who only want critical security updates, etc. The possibilities are endless! InfiniteWP has several different features that can be customized in the Settings panel. Security settings allow you to lock down InfiniteWP to allow access only from certain IPs, as well as a few other options. Email settings allow you to set up an email provider for alerts and messages from the admin panel. 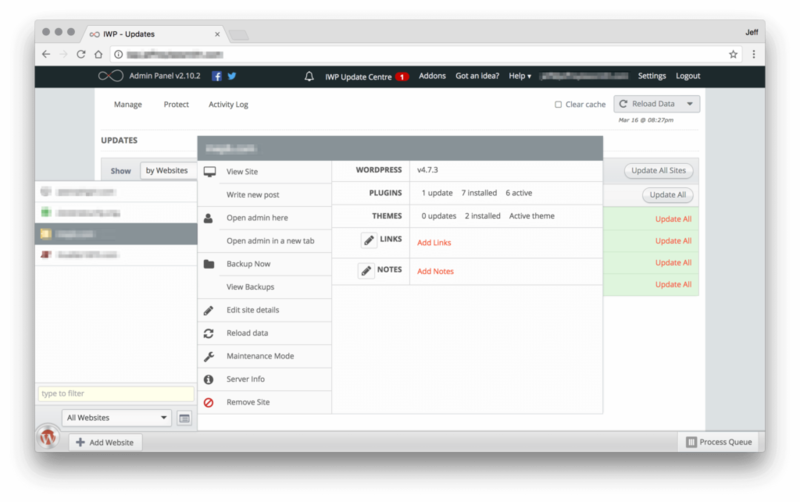 When you are on the hunt for an easy way to manage multiple WordPress installations, take a look at InfiniteWP. It will save you a considerable amount of time when you do updates in batches, and the more sites you manage, the more valuable it becomes. The only thing you have to invest is a little setup time at the start, and you’ll be ready to start being more efficient with your WordPress multi-site management! Alternatively, you can let your hosting provider take care of WordPress maintenance. SiteGround offers automatic WordPress core and plugin updates, and automatic daily backups. 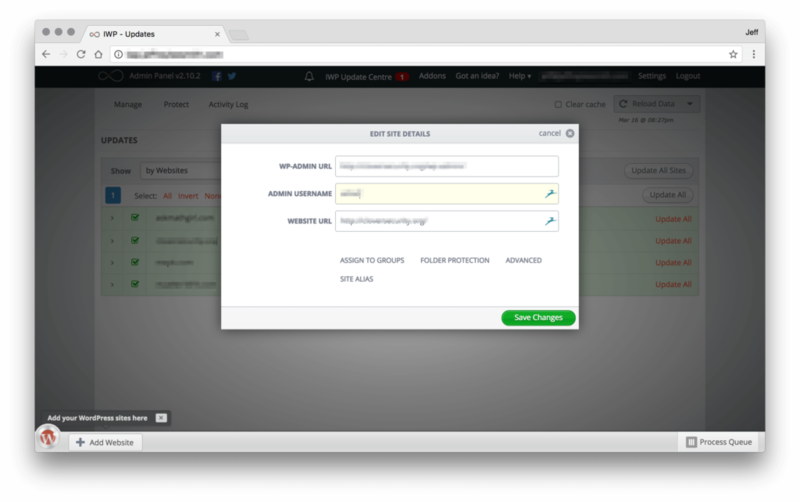 SiteGround also makes backups before each automatic update and runs checks afterwards so that you can easily restore to the latest working version if something goes wrong.